Paris St-Germain remain on course to win the Ligue 1 title after a dominant victory over Nantes sent them three points clear at the top of the table. Lyon's 2-0 win over Evian on Saturday put the pressure back on Laurent Blanc's side, but they responded with a commanding display against Nantes. Edinson Cavani and Blaise Matuidi both scored for PSG to secure the win. PSG need seven points from their last three games to guarantee the title, even if Lyon win all of their fixtures. Uruguay striker Cavani opened the scoring in the third minute of the game when the ball dropped kindly in the area. Both Cavani and Gregory van der Wiel took a swipe at the ball but Cavani's celebration suggested he got the telling touch. PSG added a second just after the half-hour mark thanks to a superb through ball from Zlatan Ibrahimovic, who returned to the starting line-up following his suspension for a foul-mouthed outburst in their 3-2 defeat to Bordeaux in March. Ibrahimovic's expertly weighted pass slipped in France midfielder Matuidi, who confidently struck the ball home. Elsewhere, Monaco cruised to a 4-1 victory over Toulose to strengthen their grip on third place and a Champions League spot next season thanks to goals from Anthony Martial, Bernardo Silva, Joao Moutinho and Valere Germain. Meanwhile, on-loan Liverpool striker Divock Origi scored his eighth goal of the season as Lille kept alive their hopes of a Europa League place with a 3-1 win over already-relegated Lens. 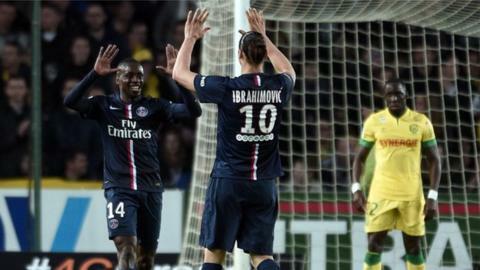 Match ends, Nantes 0, Paris Saint-Germain 2. Second Half ends, Nantes 0, Paris Saint-Germain 2. Attempt blocked. Georges-Kévin Nkoudou Mbida (Nantes) right footed shot from the centre of the box is blocked. Assisted by Alejandro Bedoya. Attempt missed. Alejandro Bedoya (Nantes) header from the centre of the box misses to the left. Assisted by Vincent Bessat with a cross. Attempt saved. Edinson Cavani (Paris Saint-Germain) right footed shot from the centre of the box is saved in the bottom left corner. Assisted by Thiago Motta with a through ball. Attempt missed. Yohan Cabaye (Paris Saint-Germain) right footed shot from outside the box is too high. Assisted by Adrien Rabiot. Yohan Cabaye (Paris Saint-Germain) wins a free kick in the attacking half. Foul by Jordan Veretout (Nantes). Attempt blocked. Adrien Rabiot (Paris Saint-Germain) left footed shot from outside the box is blocked. Assisted by Zlatan Ibrahimovic. Ezequiel Lavezzi (Paris Saint-Germain) wins a free kick on the right wing. Attempt blocked. Yacine Bammou (Nantes) left footed shot from outside the box is blocked. Assisted by Georges-Kévin Nkoudou Mbida. Offside, Paris Saint-Germain. Yohan Cabaye tries a through ball, but Ezequiel Lavezzi is caught offside. Substitution, Nantes. Yacine Bammou replaces Serge Gakpe. Corner, Paris Saint-Germain. Conceded by Papy Djilobodji. Ezequiel Lavezzi (Paris Saint-Germain) wins a free kick in the defensive half. Foul by Rémi Gomis (Nantes). Offside, Paris Saint-Germain. Thiago Motta tries a through ball, but Edinson Cavani is caught offside. Issa Cissokho (Nantes) wins a free kick in the attacking half. Substitution, Nantes. Valentin Rongier replaces Lucas Deaux. Substitution, Paris Saint-Germain. Ezequiel Lavezzi replaces Javier Pastore. Issa Cissokho (Nantes) is shown the yellow card for a bad foul. Hand ball by Issa Cissokho (Nantes). Offside, Nantes. Georges-Kévin Nkoudou Mbida tries a through ball, but Lucas Deaux is caught offside. Attempt blocked. Rémi Gomis (Nantes) left footed shot from outside the box is blocked. Assisted by Jordan Veretout. Jordan Veretout (Nantes) wins a free kick in the attacking half. Offside, Paris Saint-Germain. Adrien Rabiot tries a through ball, but Zlatan Ibrahimovic is caught offside. Substitution, Nantes. Georges-Kévin Nkoudou Mbida replaces Johan Audel. Substitution, Paris Saint-Germain. Yohan Cabaye replaces Marco Verratti. Javier Pastore (Paris Saint-Germain) wins a free kick in the defensive half. Maxwell (Paris Saint-Germain) is shown the yellow card for a bad foul. Foul by Maxwell (Paris Saint-Germain). Issa Cissokho (Nantes) wins a free kick on the right wing. Vincent Bessat (Nantes) is shown the yellow card for a bad foul.